The PointZero Airbrush deluxe cake decorating kit comes complete with all the equipment and supplies required to create gorgeous, professional-looking cakes. The PZ-258 is a dual-action, internal-mix airbrush with a tight-tolerance .35mm nozzle for sharp detail, creating spray patterns between thin-line and 1-1/2". Featuring an initial flow control, its' set screw adjusts to hold the trigger partially back so material begins to flow at the preset rate when the trigger is depressed. The PZ-260 is a dual-action, internal-mix airbrush with a tight-tolerance .3mm nozzle for sharp detail, creating spray patterns varying from hairline to 1-1/4". Its needle backstop allows you to pre-set the trigger travel, helping to produce consistent line widths. The PZ-276 is a single-action airbrush featuring an external-mix design; the spraying medium is atomized outside of the tip, making this airbrush less prone to clogging. Suited for broad spray patterns between 1/4" and 2". The Elite-125X is a lightweight (8 lbs.) oil-less airbrush compressor that delivers excellent power (1/5 HP) with approximate air delivery of 1.0 CFM, with an advanced, precision-forged piston for very little noise (55 dB). Colors include Harvest Brown, Deep Pink, Sunset Orange, Midnight Black, Super Red, Spring Green, Canary Yellow, Hawaiian Blue, Violet, Royal Blue, Neon Green and Neon Pink. Boxed set for easy setup includes an Elite-125X air compressor, PZ-260, PZ-258 and PZ-276 airbrushes, a tabletop stand, a 10' braided hose, two 22cc glass bottles, 5cc & 7cc color cups, paint pipettes, nozzle wrenches and instructions, all from PointZero. PROFESSIONAL-GRADE: Kit features the PZ-260, PZ-258 and PZ-276 airbrushes for cakes; a premium-quality set ideally suited for creating a variety of spray patterns, from fine detail to wider coverage. Kit also comes with an Elite-125X compressor that delivers excellent power (1/5 HP) with very little noise (55 dB). ADVANCED CONTROL: Featuring airbrushes with both single and dual-action functionality, this airbrush cake decorating kit is ideal for both beginners and advanced users. Single-action, external mix design is easy to use, a single press of the trigger of releases both air and paint, and is less prone to clogging. The dual-action, internal-mix design controls both air and fluid, ideal for precise, sharp details. EASY-TO-USE: Simple, compatible design allow for easy interchanging of airbrushes to suit desired need, with a high-performance and lightweight compressor that delivers clean, dry air to airbrushes for uninterrupted use. Includes an informative, instructional DVD to master use of the equipment and tools, and a tabletop stand for convenience. INCLUDES 12 PREMIUM CHEFMASTER PAINTS: Airbrush Cake Kit includes 12 bottles (.64 oz. each) of highly concentrated, spray-on food-coloring paints from Chefmaster, made in the USA. These non-toxic, deeply pigmented paints provide superior coverage, even on hard-to-color, non-dairy whipped toppings and icings. 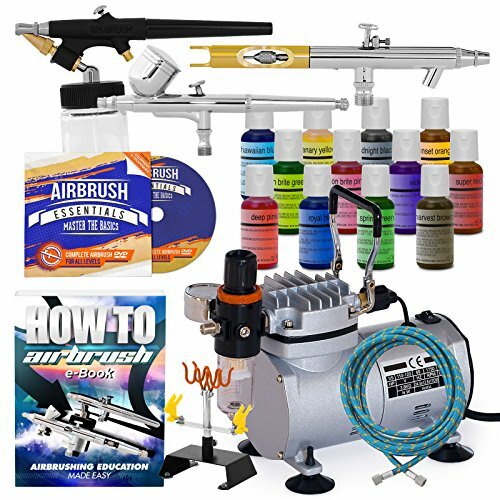 7 BONUS AIRBRUSH GUIDES: As a bonus, includes access to 7 exclusive e-Book airbrushing guides: Top 8 Cake Airbrushing Tips, Guide to Airbrush Cake Decorating, Developing Basic Artistic Skills, 10 Essential Airbrushing Tips, Airbrushing Strokes and Techniques, Airbrush Cleaning Manual, and the Airbrush Lettering Guide. If you have any questions about this product by PointZero Airbrush, contact us by completing and submitting the form below. If you are looking for a specif part number, please include it with your message.